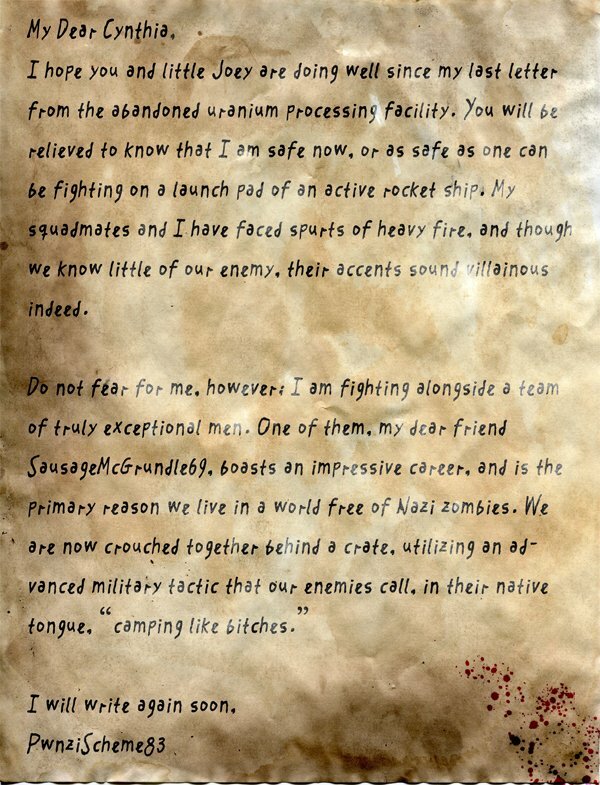 If soldiers in Call of Duty could write letters home, what would they say? Games like Call of Duty help people live out war fantasies of being the mighty hero in a safe environment, but nobody really thinks they're in any way like the real deal. Case in point, the letters seen here at Dorkly, written from the perspective of a soldier on the COD battlefield. It may start sounding almost sincere, but it quickly devolves into poking fun at the ridiculous conventions of Call of Duty: Black Ops (like being written by a brave soldier named PwnziScheme83, for one). Frankly, as someone who's been spending much of the holiday evenings playing Black Ops with his younger brother, I can't help but find it hilarious. Read all of the letters over at Dorkly.